This 1000-piece jigsaw is designed by Finchley Paper Arts Ltd. and measures 50 cm x 68 cm. 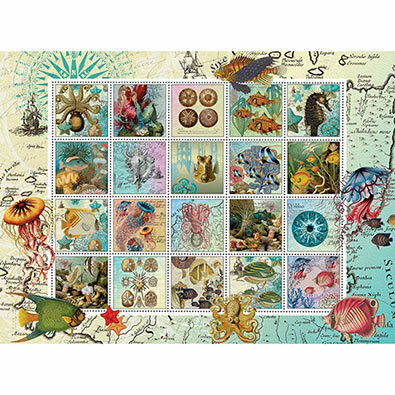 This quilt-patterned puzzle features sever different pictures from an underwater garden. Available in two-piece counts. This 1000-piece jigsaw is designed by Rosiland Solomon and measures 51 cm x 69 cm. This quilt-patterned puzzle contains a collection of chocolate treats. Available in two-piece counts. This 1000-piece jigsaw puzzle is designed by Catherine Simpson and measures 51 cm x 69 cm. This quilt-pattern puzzle depicts various scenes of children playing together. Available in two-piece counts. Coffee Cravings Quilt is a 1000 piece jigsaw puzzle designed by artist Rosiland Solomon. From cappuccino to macchiato, six individual illustrations are pieced together with borders indicating a multitude of coffees. Antique coffee pots, grinders and sweets will tempt any coffee lover. Available in two-piece counts.